The staff completed the tee renovation to #5 and #14. 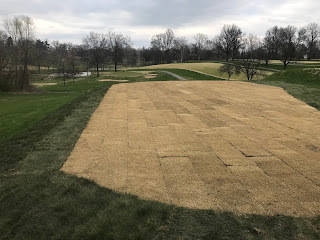 They were stripped, tilled, laser leveled, tops sodded with zoysia and perimeter with fescue. We converted one single tee pointing to 6 tee box to 2 tees pointing at the 5th green. This should assist our players with proper alignment as well as our staff when they set the markers. We aligned 14 somewhat the best we could but we were able to increase the teeing surface across the tee. If you remember, the left side fell off somewhat and reduced the overall teeing ground. I would expect a month of growth before these tees could be ready for play. In the meantime please resist the urge to walk on the surfaces. Extra water will be applied to get them to root and grow. We had some extra zoysia and the staff is busy fixing damage spots in fairways. A little bit of fescue is left and we will patch a couple of prominent rough spots near greens. 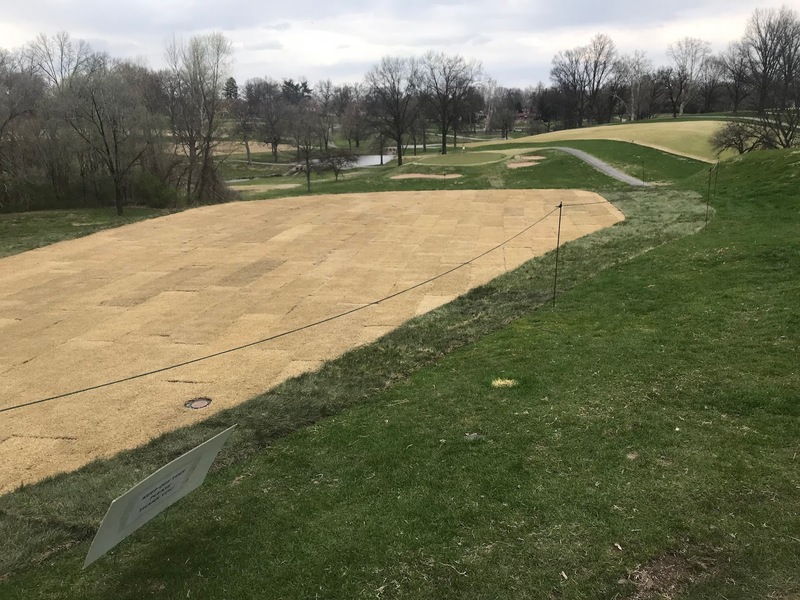 They are also going to remove sod from back area on 9 red tee, fill with dirt and sod with zoysia. This will allow us a larger area for a drop area for players lieing 3 after hitting the water. 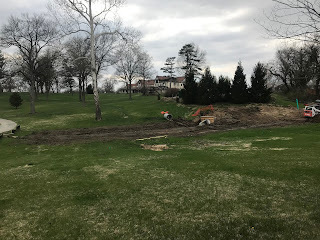 We had a contractor come out on Monday/Tuesday to remove the tops of 3 large trees that have been in the process of dying the last couple of years. # 4 Elm along Lucas & Hunt, red oak at #10 tee and a large Pin Oak on the right side of 15. Since it is spring, we intend to evaluate the effects of the tree on 10. Everyone’s assumption is it will make it easier. As you play this season, your inputs that you have noticed in your playing groups will be appreciated by the green committee to make the proper decision to plant a new tree or not. 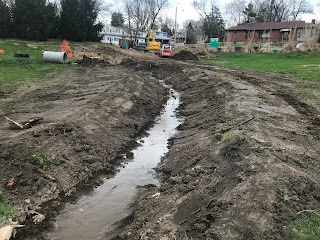 MSD contractor continues their work on #9. Glen Echo Park subdivision had combined storm water and sanitary sewers which flowed downstream and would flood areas of U-City. Their efforts are attempting to place storm water in drainage systems and sanitary where it belongs. The area to the right of the cart path will be sodded with fescue allowing it to be more natural looking and fit into our golf course. No gabian in this project. Hopefully it will be completed in the next couple of weeks giving it plenty of time to grow in for summer. The last pic is our effort to reduce compaction on the right entrance to 10 fairway. We placed a bench across the path to request golfers to use the left cart path to enter the fairway and proceed to their golf ball. This will reduce the impacts on dormant grass as it tries to break winter's hold. We understand if your ball has gone to the right or not crossed the lake but if all players have crossed safely, please use the left path. Left side look of 14 tee. Not quite down the left side but much better than it has been. Right side. We were able to get the top right corner to align down the right side. This area will be sodded completely and will handle storm water as it comes into the golf course. Arrow for 10 tee. Please go down the left cart path to enter fairway. Sod arrived this morning after this weekends rainfall. Should have both 5 tee and 14 completed by Wednesday. More to come tomorrow. 25 degree low for this morning, that is a bit chilly for April. Luckily for the zoysia it is just beginning to green up down in the crown of the plant so we did not lose much ground. We just some rough grass on the short range yesterday. First mow of the tall grass this season. We do have a few spots on the course that might need some trimming by next week. I feel much better this year going into the season than last year. A year with our staff operating for the most part on their own everyday. All of us are much better organized than last year plus we did nothing to zoysia going into winter so we should be in good shape this season. No doubt last year we had some growing pains with me being completely consumed in my clubhouse/GM role. 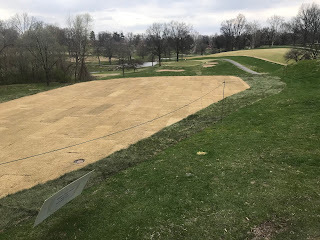 We've got our areas sprayed as needed, we are a little behind in pre-emergent applications in the rough after all the rain but with cold temperatures and applications starting last week, we should be able to catch up pretty quickly. Seed head applications for greens has shown excellent results so far with very few seed heads emerging. We will have seed heads but I think our levels will be reduced with our late November application being instituted this season. We do have some significant tree removals to perform here in the month of April. The dead oak off of 10 white tee, believe the Oak is dead along the right of 15 about 100-150 yds but need to verify and the dead elm along Lucas & Hunt on #4. We will do some of the work ourselves and some handled by contractor to reduce weight on upper levels of tree to our staff. Laser-leveled both 5 tee and 14 on Thursday. 5 tee fairly solid but 14 tee is a bit soft from moisture so we will have to delay its install to insure it dries down properly. I would expect we will get at least one of them grassed in the next 7-10 days and hopefully 14 soon thereafter. This will be my 10th full growing season at Glen Echo. I think we've made tremendous strides over those 10 years. We had a bit of a rough greens year in 11 and a very dry year in 12, zoysia took a bit of a ding last summer but overall I think this small in number and dedicated group of staff members have provided excellent conditions for our members and guests. Operations much larger than our organization have had difficulties matching our conditioning year end and year out. I look forward to seeing you on the course. Mike McNeil from Schaefer-Meyer came out and tilled the 2 tees today on 5 and 14 that are being renovated. He hopes to laser level tomorrow. Need some dry weather before sod can be harvested. Maybe late next week. We will call tomorrow to see what the possibilities will be for sod.